Mesothelioma Cancer : Signs and Symptoms Symptoms or signs of mesothelioma may not appear until 20 to 50 years (or more) after exposure to asbestos. Shortness of breath, cough, and pain in the chest due to an accumulation of fluid in the pleural space (pleural effusion) are often symptoms of pleural mesothelioma Symptoms of peritoneal mesothelioma include weight loss and cachexia, abdominal swelling and pain due to ascites (a buildup of fluid in the abdominal cavity). Other symptoms of peritoneal mesothelioma may include bowel obstruction, blood clotting abnormalities, anemia, and fever. If the cancer has spread beyond the mesothelium to other parts of the body symptoms may include pain, trouble swallowing, or swelling at the neck and face. these symptoms may be caused by mesothelioma or by other less serious conditions. 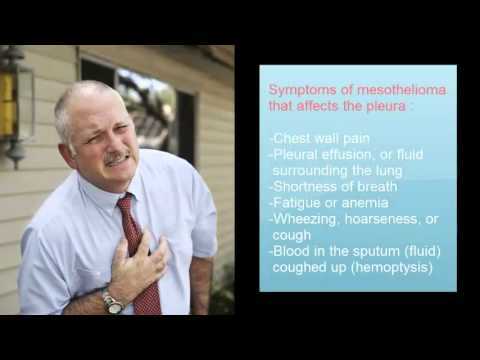 Mesothelioma that affects the pleura can cause these signs and symptoms: chests wall pain pleural effusion of fluid surrounding the lung shortness of breath fatigue or anemia Wheezing, hoarseness, or cough Blood in the sputum (fluid) coughed up (hemoptysis). In severe cases, the person may have many tumor masses. The individual may develop a pneumothorax, or collapse of the the lung. The disease may metastasize, or spread to other parts of the body. Tumors that affect the abdominal cavity often do not cause symptoms until they are at a late stage. Symptoms include: abdominal pain Ascites, or an abnormal buildup of fluid in the abdomen a mass in the abdomen problems with bowel function weight loss In severe cases of the disease, the following signs and symptoms may be present : Blood clots in the veins, which may cause thrombophlebitis, Disseminated intravascular coagulation, a disorder causing severe bleeding in many body organs Jaundice, or yellowing of the eyes and skin low blood sugar level pleural effusion Pulmonary emboli, or blood clots in the arteries of the lungs Severe ascites. A mesothelioma does not usually spread to the bone, brain, or adrenal glands. Pleural tumors are usually found only on one side of the lungs. .